Blu-U (Light) System – Let There Be Light! 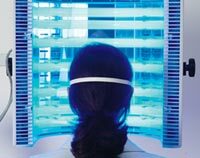 People who have suffered with acne, rosacea and sun damage are excited about BLU-U™ Blue Light Photodynamic Therapy. It is a relatively simple new procedure combining a medication with a blue light. It is not a laser but a light treatment. “There is a new hope for millions of people who struggle with these types of skin conditions,” says Marina Buckley, MD of MilfordMD Cosmetic Dermatology Surgery & Laser Center in Milford, PA. Traditional therapies for acne involve keralytic agents, such blu light follicles as the retinoids, which thin the top layer of skin and unplug the oil glands; topical antiseptics and antibiotics, which diminish the number of bacteria in the skin; and oral antibiotics, which similarly diminish the bacteria. These treatments have their benefits, but also have their limitations of being inconvenient, and occasionally toxic.